An inundated road outside Takht Damdama Sahib in Talwandi Sabo on Thursday. 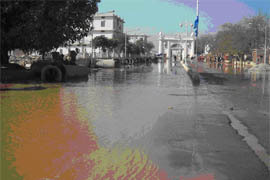 Water entered several areas of this holy town early this morning following a breach in a canal distributary. Though there was no casualty, life was thrown out of gear. Dozens of vehicles, including some heavy ones, got stuck in the mess as the soil beneath recently laid sewer pipes caved in, following which some roads also got sunk. The canal distributary was breached at a point near Dashmesh Public School under which sewerage board officials had recently laid a sewer pipe. Adding insult to injury, senior officials reached the spot only when the situation had turned difficult and people were themselves putting in efforts to cope with it. People termed the incident as a fallout of the hurry shown by sewerage board officials to bring the whole town under a sewer system (a project worth Rs 17 crore) before the Baisakhi Mela to be held here in April. The district administration has sought a detailed report regarding the breach from the officials concerned. It is reported that an employee of the Punjab State Electricity Board was the first to notice the breach in the early hours. He immediately called up the police. Some other passersby initiated efforts to plug the breach. They also sought help from nearby villages. Later, on receiving information that water had gushed into fields adjacent to Takht Damdama Sahib, the administration launched rescue work. With the help of cranes, big vehicles were pulled out. Officials of the Irrigation Department said the canal distributary was dry when the sewerage board officials laid the sewer pipe beneath it. As per the schedule, they released the water supply in the distributary on Wednesday evening after which the incident took place. They put the blame for the breach on the contractor assigned the job as well as the sewerage board officials concerned who allegedly failed to take proper care to check the joints after laying the pipe. MS Kang, SDM, Talwandi Sabo, said: “Immediately after receiving information, operations were initiated. All vehicles stuck in the mess were pulled out and traffic was managed”. Replying to a query about the action to be initiated against the guilty persons, the SDM said: “I have sought a report from sewerage board officials, who will submit it by Friday”.